Second release for the year - Saint Joan's debut full length release and long-awaited follow up to their self-released "One at Twilight" mini-album. 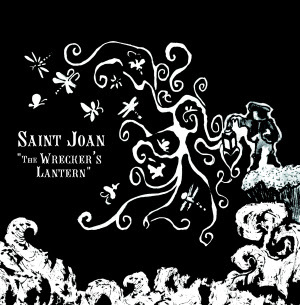 About the release: The title of Saint Joan's first full length album alludes to the 19th century practice of luring a ship onto the rocks by faking the beam of a lighthouse with a swinging lantern, causing the ship to run aground, its treasure to be plundered. It continues the band's interest in all things maritime…the sea as the subconscious as Carl Jung would have it. The band takes inspiration from Hieronymus Bosch in "The Four Last Things" and The Tempest in "Singing Bowl". They conjure love and loss, seasick sailors and freight trains, hills and mountains, rivers and fading street lights. The album continues the sound established by band's first release, the 7" single "All Things Melt/The Ice House" as well as the more sparse chamber music leanings of 2005 mini album "One At Twilight". Epic, psychedelic stream-of-consciousness psychodramas about loss like 'December' contrast with the more fragmented, melancholy of "Gone" with its looping guitar and lush strings. The widescreen folk-rock drive of "Singing Bowl", place it alongside vintage Walkabouts. Recorded in an old warehouse in the autumn "The Wrecker's Lantern" evokes time and place at every turn and yet seeks to transcend them. It is the sound of beauty, timeless and incarnate. About the band: Saint Joan are five musicians originally West Bridgford in Nottingham, England, Mohacs in Hungary and Strasbourg in France. A few musicians have come and gone much like the English summer but they have settled as they are now, and call on the odd flautist, cellist, vibraphone-player, et al, when the mood takes them. They are inspired by stream-of-consciousness prose, like James Joyce and Virginia Woolf, by the "darkness on the edge of town", flawed beauty and black comedy. They listen to many things: Nick Cave, The Tindersticks, Jonathan Richman, The Velvets,Tom Waits and Galaxie 500 among them. "Hints of disheveled, Tindersticks- style romance peek out from behind a violin-lined veil of Low-like austerity. Ellen McGee's throaty purr and harrowing falsetto conjures images of a young Polly Harvey communing with 60s folk/blues troubadouress Judy Henske." - Magnet Magazine review of "One at Twilight"
"…sleepy sullen sensuality conjures smoky opiated dreams in the mind of the listener… when Ellen sings, she makes heartache sound like something truly beautiful." - Dream Magazine review of "One at Twilight"
Go to: Camera Obscura Web Site to purchase on-line via Paypal. We are proud to announce the imminence of the much awaited debut full-length CD from night-side Nottingham folk-rockers Saint Joan, set to consolidate the reputation established by the magnificent 2005 mini-album "One at Twilight". Echoes of PJ Harvey, Opal, The Walkabouts and even Joy Division coalesce into a beautiful new form of dream pop. "A wonderful British take on the glow of post-jangle Californian strum pop" quoth Byron Coley in The Wire. Visit them at the Saint Joan web site or on their MySpace page for more info and goodies. Major Press Love for Tanakh's "Saunders Hollow"!